Last November 21 through 23, six members of a French expedition to Antarctica—Antoine Cayrol, David Lacoste, Paul Dudas, Emmanuel Chance, Laurent Bibollet, Yann Delevaux—made the first traverse of the "Seven Sisters," a string of dark, rocky, snow-covered peaks above Port Lockroy, on Wiencke Island in the Palmer Archipelago. The natural harbour of Port Lockroy has long been a favorite disembarking spot for cruise ships, and even features a post office and gift shop. Just above it, the Seven Sisters trail off along a stark, serrated ridge from the island's high point of Savoia Peak (1415m). On November 21, a Zodiac dropped off the team at the toe of their "first" sister, the southwestern-most Janssen Peak (1085m), likely first ascended in 2000, via its east face, by a New Zealand team (Richard and Lizzie Craddock, Anton Woperis and Mike Roberts). Starting at sea level, the French climbed Janssen by its south side. They encountered five hundred meters of snow and ice up to fifty-five degrees, and a three-meter vertical step just below the summit. Topping out at 5 p.m., the climbers followed a "very fine snowy ridge" to tag Jansen's second summit, then made ten rappels down the south side to bivouac at Janssen's bergschrund. The next day, the team circumnavigated Janssen via its southeast side and then climbed three hundred meters of snow and ice to regain the saddle between Janssen and the second sister. The ridge crest led to an overhanging snow mushroom, where the men made one rappel to the ridge's east side then climbed two pitches featuring eighty-degree ice and sixty-degree snow to the summit. A sharp arete led onward; now the team made three rappels off deadman anchors amidst a huge snow mushroom to reach the saddle below sister No. 3, climbed via steep (sixty- to seventy-degree) snow. Three more rappels along the ridge led to the col below sister No. 4, surmounted via a section of sixty-five degree snow and a serac skirted along its east side. Sister No. 5 featured fifty-degree snow slopes and a blind descent in the "worst fog ever" along a gentler incline. Sister No. 6 included more steep snow (two sections at seventy degrees) and two rappels off the summit to a wide, flat glacier. The men tagged their seventh peak, the northernmost sister (aka the First Sister), at 7 a.m. on November 23, and then made eight rappels down a wide colouir on the Lockroy side to return to their sailboat, the Podorange. All told, they had traversed more than eleven kilometers on a "very long, committed and exposed climb" graded TD+. 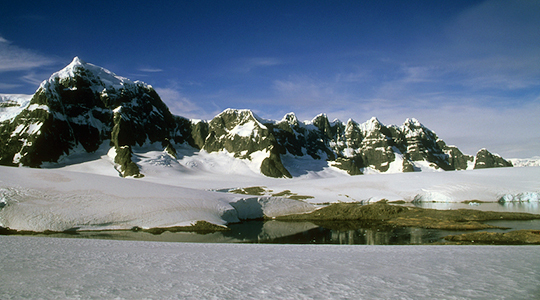 While some of the sisters (Janssen and the First Sister) had been climbed previously, the ridge had not been traversed in its entirety, despite its prominence and proximity to Savoia Peak, the first real mountain climbed on the Antarctic Peninsula, during Jean-Baptiste Charcot's 1903-'05 French expedition to the continent. In 2004-2005, a mostly British team visiting the area aboard Alan Hubbard's yacht Gambo tried the traverse three times, only to be bouted by bad weather. Australian climber and Antarctica climbing historian/explorer Damien Gildea said that the maritime snow at low altitudes, as on the Seven Sisters Traverse, is often sketchy. "Generally, the rock there is not great," he says. "The problem with these ridge climbs there is that prolonged periods of good weather melt the crest and cornices, chunks fall off, and make big gaps in the ridge that stop climbers. Sometimes more snow is good." To close out the expedition, the French team members also made a first ski/snowboard descent of a steep (fifty-five-degree) colouir on Mount Janssen on November 26, as well as the first ascent of the southeast tower (700m, TD/TD+) of nearby Cape Renard on December 1, with an M5/seventy-degree ice crux right below the summit. The latter climbed they named Voie Podronard, after their sailboat.